Post Your Review on Square R/C M4 Aluminum Serrated Wheel Nuts (Orange) 4 pcs. 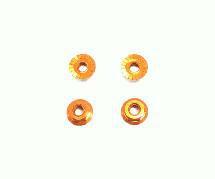 Square R/C M4 Aluminum Serrated Wheel Nuts (Orange) 4 pcs. Alloy Nuts, Spacers, Posts & Washers>Square R/C M4 Aluminum Serrated Wheel Nuts (Orange) 4 pcs. Write a review for Square R/C M4 Aluminum Serrated Wheel Nuts (Orange) 4 pcs.